Oppo is launching its true flagship Find X on June 19. The company confirmed the news on Tuesday with a press release, and now all it has left is to tease various features until the device is launched. 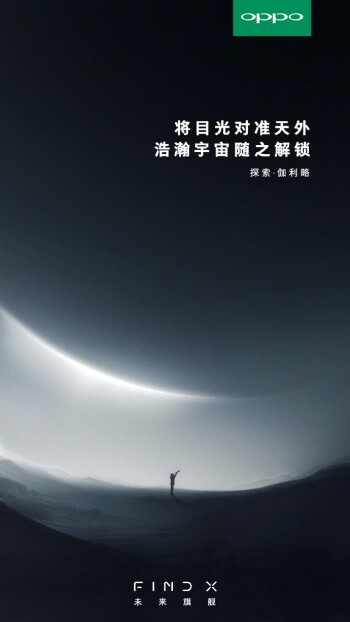 The latest post on the Chinese social network Weibo is an image of a person with a telescope, looking at the sky. A cryptic text, roughly translated as “Galileo looked at the sky and reached the universe”, suggests that the Find X is likely to have massive optical zoom since the astronomer and mathematician is the inventor of the telescope. We already know that Oppo is capable of building a camera with 5x lossless optical zoom. The tech was featured at MWC 2017, and we had a hands-on with the concept device. It used a periscope-style zoom lens and a sensor that has 3x optical magnification and then reaches 5x with software enhancements, but without compromising the quality. A rumor from Monday suggested the phone will have a vertical dual cam setup on the back, while specs included Snapdragon 845 chipset, 8/256 GB memory and Super VOOC charging for the 4,000 mAh battery.